This collection of essays, edited by leading scholars in the field, focuses on how expressive genres such as music, dance and poetry are of enduring significance to social organization. 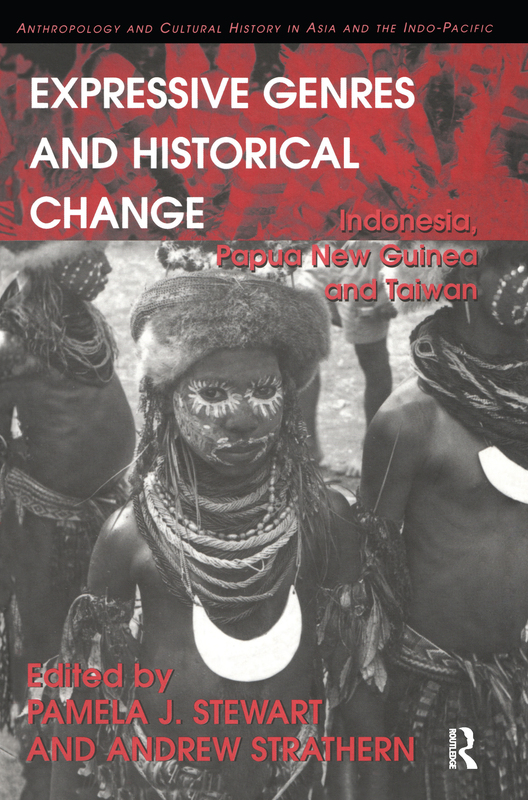 Research from New Guinea, Indonesia and Taiwan is used to assess how historical changes modify these forms of expression to adjust to the social and political needs of the moment. The volume is unique in exploring the significance of expressive genres for the social processes of coping with and adjusting to change, either from outside forces or from internal ones. The contributions detail first-hand fieldwork, often conducted over a period of many years, and with each contributor bringing their experience to bear on both the aesthetic and the analytical aspects of their materials. Comparative in scope, the volume covers Austronesian and non-Austronesian speakers in the wider Indo-Pacific region. Contents: Introduction, Andrew Strathern and Pamela J. Stewart; Chanted tales in the New Guinea Highlands of today: a comparative study, Alan Rumsey; Duna Pikono: a popular contemporary genre in the Papua New Guinea Highlands, Pamela J. Stewart and Andrew Strathern; ’Our Heart Always Remembers, We Think of the Words as Long as We Live’: sacred songs and the revitalization of Indigenous religion among the Indonesian Ngaju, Anne Schiller; Calling on the ancestors to stop crime: ritual performance in an age of intermittent violence, Janet Hoskins; The camera is working: Paiwan aesthetics and performances in Taiwan, Tai-li Hu; The aesthetics of politics: transforming genres and meanings in Melanesia, Lisette Josephides; Melpa songs and ballads: junctures of sympathy and desire in Mount Hagen, Papua New Guinea, Andrew Strathern and Pamela J. Stewart; Emphatic speech, expressive genres, and the dancing-songs of the Eipo and Yalenang (Eastern Mountains of West Papua), Volker Heeschen; Index. Dr Pamela J. Stewart and Professor Andrew Strathern are collaborators who are based in the Department of Anthropology at the University of Pittsburgh, USA, and they are, respectively, Visiting Research Fellow and Visiting Professor in the Department of Anthropology at the University of Durham, England. They have been Visiting Research Fellows at the Institute of Ethnology, Academia Sinica, Taipei, Taiwan during 2002, 2003, 2004, and 2005. They have published many books and articles on their research in the Pacific, Asia, and Europe.